A new study demonstrates the feasibility of using a wearable electromyography device to detect tonic-clonic seizures. A wearable electromyography (EMG) device detected 93.8 percent of generalized tonic-clonic seizures (GTCS) in real time, according to a study published online in Neurology on January 5. The device produced 0.67 false GTCS false alarms per 24 hours, but nearly all of those occurred during the daytime. The Neurology paper was among the first to demonstrate its results prospectively, using a pre-specified cut-off for determining that a GTCS is occurring. And at nine seconds, its latency in doing so (from the time of onset as measured by an independent observer) is also among the fastest described so far, the study authors and independent experts noted. Altogether, they demonstrate the growing feasibility of incorporating wearable seizure-detection devices into clinical practice — both to quantify for physicians how well patients are responding to medication, and to help caregivers respond quickly to ongoing seizures. The current study included 71 patients who had been referred to long-term video-EEG monitoring on suspicion of GTCS. The surface EMG device, called EDDI and manufactured by IctalCare, was placed on each patient's biceps. Mean recording time per patient was 53.18 hours, with no adverse events reported. Seizure detection by the EMG device was real-time, fully automated, and compared to events identified by trained experts who evaluated the video-EEG recordings and were blinded to device data. With a sensitivity of 93.8 percent, the device detected 30 of 32 GTCS over a total recording time of 3,735.5 hours. The rate of false alarms was 0.67 per day, but two-thirds of the patients had no false alarms. For 24 of 71 patients (34 percent) who did experience a false alarm, the most common reason was due to physical exercise, which accounted for 68 percent of all false alarms. Only two false alarms occurred during sleep. His group has not been able to determine why two-thirds of the patients had zero false alarms while two of the 71 had as many as 10. The results reported in Neurology are “an improvement, but only an incremental one,” said Dr. Litt, who is currently studying the use of an implantable EEG monitoring and therapeutic devices. “EMG devices can be quite useful for some patients, but I believe that EEG remains the gold standard for seizure detection and warning,” he said. The results reported in Neurology are “an incremental improvement,” said Dr. Litt, who is currently studying the use of an implantable EEG. “I still think EEG is going to remain the gold standard,” he said. The study he coauthored was not prospectively designed, Dr. Loddenkemper noted, but was meant to find the best algorithm and cut-off point for detecting GTCS. “The studies had different methods because they had different goals,” he said. Jon Bidwell, a PhD candidate at the Georgia Tech Everyday Computing Lab, also was a coauthor of the Empatica study. Dr. Beniczky reported no disclosures related to the study. But since he completed the study of the EDDI device, it has been sold to Brain Sentinel, which has asked him to be a consultant. IctalCare, the manufacturer of the EDDI device, granted the investigators free-of-charge use of the device throughout the study period. Dr. Loddenkemper is part of pending patent applications to detect and predict seizures and to diagnose epilepsy with devices different from the ones used in the Epilesia paper. He also has received sensors from Empatica and Affectiva to perform the reported research. Dr. Litt is a cofounder of a startup company, Blackfynn, which does data integration and analytics. •. Beniczky S, Conradsen I, Henning O, et al Automated real-time detection of tonic-clonic seizures using a wearable electromyography device http://n.neurology.org/content/neurology/early/2018/01/05/WNL.0000000000004893.full.pdf. Neurology 2018 Epub 2018 Jan 5. •. Krauss GL, Ryvlin P. Non-EEG seizure detection is here http://n.neurology.org/content/early/2018/01/05/WNL.0000000000004901. Neurology 2018; Epub 2018 Jan 5. •. Onorati F, Regalia G, Caborni C, et al Multicenter clinical assessment of improved wearable multimodal convulsive seizure detectors https://www.ncbi.nlm.nih.gov/pubmed/28980315. Epilepsia 2017;58(11):1870–1879. •. Halford JJ, Sperling MR, Nair DR, et al Detection of generalized tonic-clonic seizures using surface electromyographic monitoring https://www.ncbi.nlm.nih.gov/pubmed/28980702. Epilepsia 2017; 58(11):1861–1869. •. Ulate-Campos A, Coughlin F, Gainza-Lein M, et al Automated seizure detection systems and their effectiveness for each type of seizure http://http://www.seizure-journal.com/article/S1059-1311(16)30071-1/abstract. Seizure 2016;40:88–101. 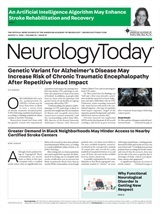 Neurology Today18(3):1,21-21, February 8, 2018.